You Magnificent Bastards: Warhammer: Tale of 4 Gamers? Warhammer: Tale of 4 Gamers? 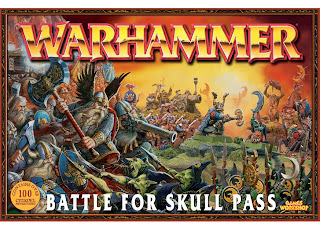 So I went yesterday and picked up Battle For Skull Pass, and I'm excited to start playing Fantasy for the first time in 8+ years. Just looking at the models has me excited to paint them. I traded away the Goblins and already now have about 1000-1200 points of Dwarfs. While at Pandemonium for my Planetstrike game this week, daskrusher and Gargunki and I discussed trying a Tale of 4 Gamers style campain or league for WHFB. daskrusher is signed up as Orcs and Goblins, and I am signed up with my Skaven. So the Skaven are on hold for now in preparation of painting them on schedule for the league. As far as setup, I am looking at 4 periods. Each period would be 3 weeks after lists are submitted until armies are to be painted and games are to be played. Probably 2 weeks for 3 games. The first period we will probably be able to knock out all of the first games in one night. For the 4 period point totals, I would like to do 500-1000-1500-2000 points. The first game will be small, but I think it will be the most manageable starting from scratch. Plus beyond the To4G we will have further room to expand into a tournament sized army. Right now I am looking towards a start date of Nov 10, which would make our first games Dec 1. But first we need to find 2 more players.